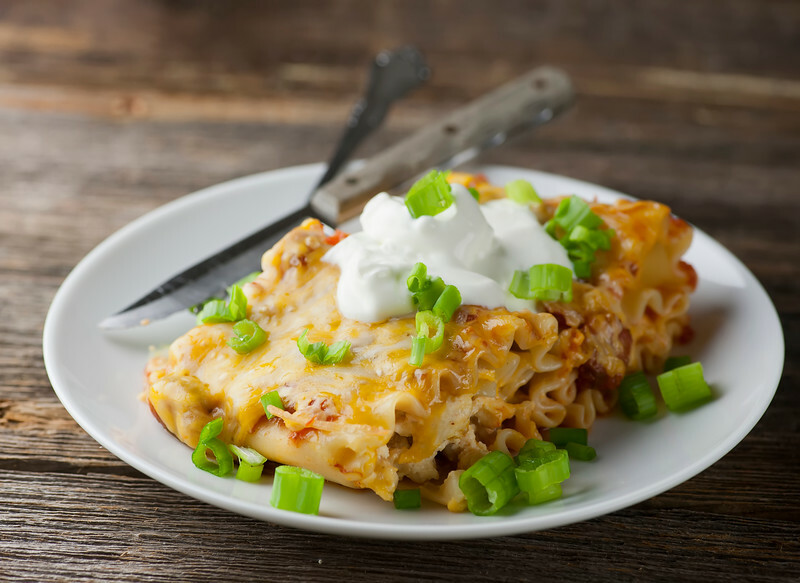 At this point, I think I have messed with enough traditional dishes (please see Macaroni and Cheese Cupcakes as a prime example) the fact that I am about to rave about this spiced up lasagna topped with sour cream and scallions will not surprise you one little bit. So here I go: I’ve kept the noodles and the ricotta, but the tomato sauce has been replaced with salsa, the mozzarella with Jack and cheddar cheese, the ground beef with shredded chicken, and there’s some chili powder lurking in there. And while I admit that even I thought I was skating on some thin lasagna ice…it works! The assembly of all these goodies is also a little different, because instead of doing flat layers of noodles/sauce/cheese, I like to spread the noodles with the cheese mixture and roll them up. Nestle them together in a baking pan spread with salsa (helps them not stick), pour more salsa and cheese on the top, cover the baking dish with foil (helps it not dry out) and bake it up. When it comes out of the oven, those luscious spicy lasagna rolls can be easily scooped out with a spatula…no trying to cut slippery lasagna into squares. Top with some festive toppings (I went with sour cream and scallions, but guacamole would also be amazing!) and serve. You can vary the spiciness by picking anything from mild to hot salsa. I am a wimp, so I usually pick mild. 2. This is a great way to use up leftover cooked chicken, and if you don’t have any lying around, a rotisserie chicken or chicken breast from the supermarket is totally perfect. 3. One of the things I love about roll-up lasagna, aside from the whole non-cutting-thing, is that it’s great portion control. One roll for your smaller eaters, two for your hearty eaters. That’s all I have to say about Mexican Lasagna. Except, make it, and tell me what you think! Preheat oven to 350. Spread a thin layer of salsa on the bottom of a medium baking dish. Stir ricotta, egg, chicken, chili powder and jack cheese together. Lay noodles out flat and divide the ricotta mixture among the noodles. Roll the noodles up and place in the baking dish. Spread with remaining salsa and the cheddar cheese. Cover with foil and bake for 30 minutes. (If you like a teeny bit of crispiness on your lasagna, remove the foil during the last 10 minutes. How is the chicken incorporated into the recipe? It is listed as an ingredient, but not noted in the directions. Is it part of the ricotta mixture?